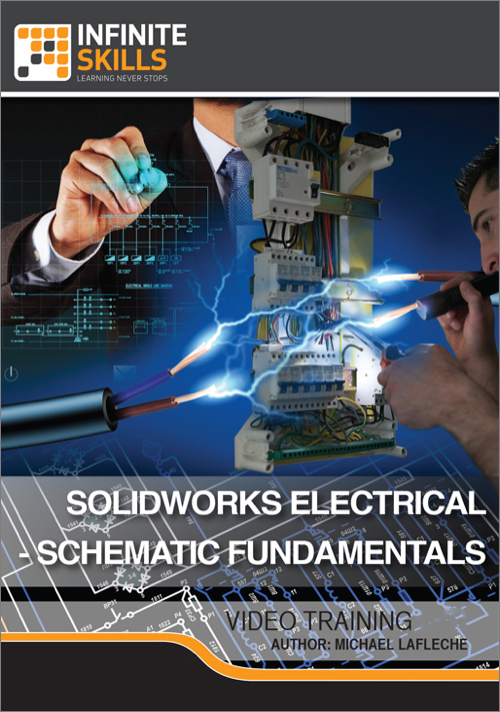 In this SolidWorks Electrical – Schematic Fundamentals training course, expert author Michael LaFleche teaches you how to harness the power of SolidWorks to fully document line diagrams, schematics, terminal strips, and PLC’s. This course is designed for users that already have a basic working knowledge of SolidWorks and basic schematic blueprint reading skills. You will start by learning how to create a project, and then jump into creating a new schematic. From there, Michael teaches you about detailed cables, and how to add manufacturer parts to symbols. This video tutorial also covers multi-wire schematics, references, symbol libraries, and PLC’s and cabinet layout. Finally, you will learn how to configure the SolidWorks Electrical environment to suit your working needs, with custom symbols, reports, and manufacturer information, to enable a complete Bill of Materials. Once you have completed this computer based training course, you will be fully capable of using the SolidWorks Electrical Schematic software for your own projects, and be able to collaborate with multiple engineers to work on projects at the same time. Working files are included, allowing you to follow along with the author throughout the lessons.